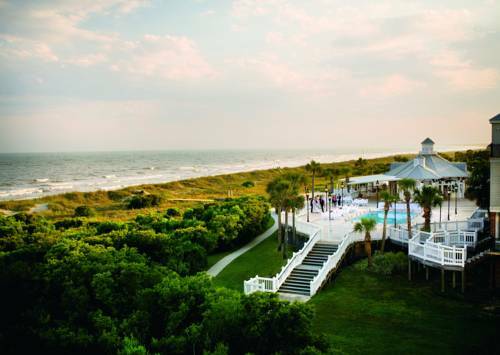 Wild Dunes Resort rests on the northern tip of the Isle of Palms A barrier island off the coast of South Carolina where guests can enjoy the spirit of the Carolina low country in a relaxing peaceful atmosphere. A favorite vacation spot for two decades the property offers a variety of lodging options as well as world renowned golf top ten tennis nations fifth ranked family recreation program extensive meeting facilities and over two miles of pristine beach. Just 20 minutes away from Charleston. The resort is a 1600 acre private gated oceanfront paradise surrounded by the Atlantic ocean and the Intercoastal Waterway and offers more than 350 one to four bedroom villas and three to six-bedroom homes many with spectacular views of the Atlantic ocean and the emerald fairways of tranquil lagoons. Also on property is the new Village at Wild Dunes brand new luxury condominiums. In addition the resort features AAA four diamond rated Boardwalk Inn 93 luxurious rooms and suites. There are 8 junior suites a poolside hospitality suite and a 1700 square feet grand presidential suite on the top floor featuring extraordinary views of the Grand Pavilion and Atlantic ocean. Resort is located on the beach - 30 minutes northeast from downtown Charleston. Charleston was recently voted the top city in the world by Travel and Leisure. The resort is easily accessed by highway 17 and is a 30 minute drive from CHS airport. The Isle of Palms only boardwalk cafe. Open seasonally with a panoramic ocean view- the Grand Pavilion Cafe and Bar serves classic beach fare. Sandwiches/snacks/drinks/cocktails. Family style dinners do not need to be a challenge. Wild Dunes delivers special meals to your Village suite or villa. Minimum 48 hour notice needed for all family dinners- includes disposable utensils/condiments and delivery. ~44 miles from Isle of Palms. ~78 miles from Isle of Palms. ~79 miles from Isle of Palms. Diinner theater performance of high seas clashes between two ships featuring swashbuckling pirates, voluptuous mermaids, and a projected avatar of Dolly herself. ~86 miles from Isle of Palms.